When you come to Bali, you enter not only a wonderful island, but also a magical world full of gods, filled with spirits and demons. Everywhere at any time of the day or night, this becomes evident and anyone who does not really notice this must be blind, deaf and odourless at the same time. Already in the morning, the unsuspecting tourist stumbles across pretty flower arrangements in small bowls made of banana leaves. At breakfast and later on at dinner, the scent of the dishes interweaves with the sweet and woody smell of incense sticks, which light the waitress at an altar for the ancestors and gods. The mirror of the rented car is decorated with lucky flower chains, and in front of the windshield there is a small offering. 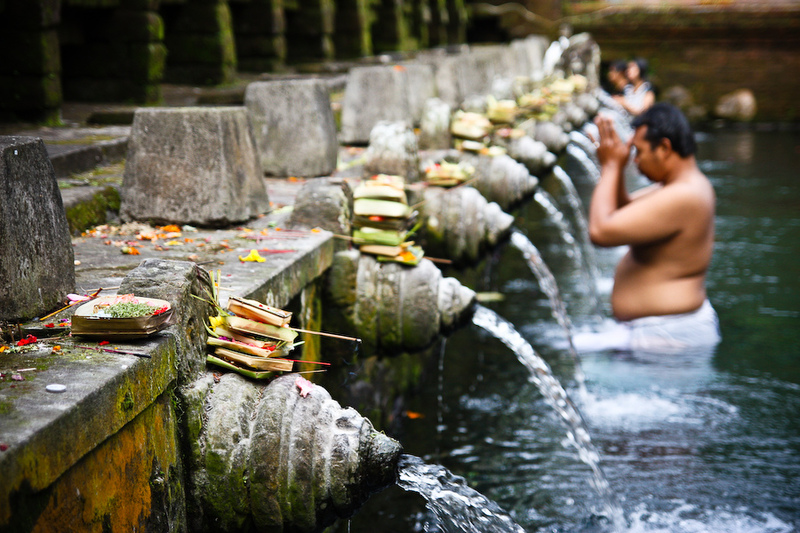 Hinduism in Bali is already different from that practiced in India, for example. The Hindu Dharma religion of Bali is imbued with animistic rites and rules, interspersed with Buddhist elements and therefore a Balinese peculiarity. The many offerings are meant to appease the demons and evil spirits. And so you have to be careful not to step on them when walking through the streets, because that would be a big faux pas. There is no separation of life and faith, which is why you can see festively dressed believers jokingly driving on the loading roofs of trucks to a ceremony in one of the thousands of temples on the island. 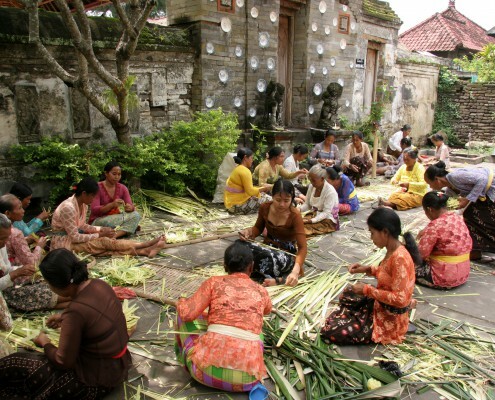 The Balinese people’s everyday life is permeated by their religion, always and everywhere. You may hear the sounds of Gamelan instruments from a dance group behind the high walls of a farmstead, but the ghost wall, which is supposed to protect you from demons, refuses you to look inside – Ghosts can only walk straight ahead. Everything is connected to everything, every single one is part of the whole. It is not your own interests, but the environment and its balance that are in the foreground. The dharma, a kind of law that regulates the correct fulfillment of balance and manages the world as a whole, must be fulfilled by everyone through their own actions (karma). Only then does harmony develop. And so the faithful Balinese are constantly busy creating a balance in their world, establishing a balance between good and evil, the gods and demons and influencing the balance of forces in their favour. The gods live with their ancestors on the volcano Gunung Agung (kaja), the evil demons live in the underworld or towards the sea (kelod). Between above and below (kaya and kelod) man is caught in the cycle of rebirth. Only those who lead a life appropriate to dharma can break the cycle at the end by reaching the moksha and joining forces with the great deity Sanghyang Widhi Widhi Wasa – but this is usually only reserved for ascetics who lead a life free of any desire. Numerous holy men and priests regulate the equilibrium of the island and its inhabitants, each with their own specific tasks. A pedana, a Brahmin priest, has the highest priestly status. His deity is Shiva. As a learned man, he deals with religion his whole life, reads and knows ancient writings on medicine, philosophy and theology, but also texts of the law and myths and he is also powerful of Sanskrit – only in this way can he understand the secret Lontar writings, which are written in the forgotten language. 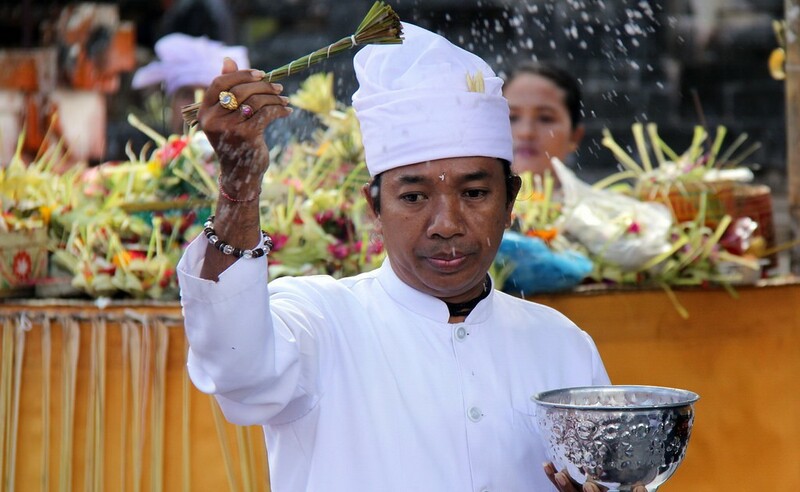 The pedana is a master in the production of holy water (thirta), which is needed for almost all ceremonies. Every morning he performs the complicated rituals, speaks mantras and prayers and blesses the spring water with certain movements of his hands (mudra). When the bright sound of the little bell resounds for the last time, the ritual is finished and the water becomes thirta. This can have different degrees of purity and cleaning – depending on the application. whether it is used in ceremonies, e. g. weddings and births, for healing or as an offering in everyday life. Next to it the pedana is also important for celebrations, which concern the family (birth, tooth division, marriage, death). Those, who can afford it engage a Brahmin priest for it. Certain cleansing ceremonies, such as those that take place during death feasts, can only be carried out by him – because of his status and knowledge, he has a natural immunity against many evil forces and the devastating effects of incantations that he has to use. The auxiliary priest of pedana is the pemangku. Since he often comes from the lowest caste, he is the connection between temple and people. Each individual of the one thousand temples on Bali has its own pemangku, large temples also have several. The priest takes care of the temple walls and the victims. 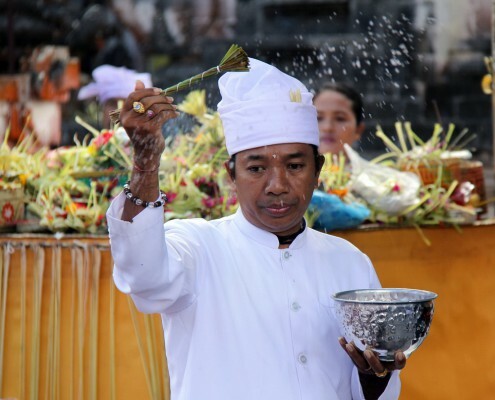 Thus, the invitation of the ancestors and gods to the temple festivals organized by the pemangku is also his task. There is also an important man for the dark forces, the sengguhu. He worships Vishnu first and foremost and takes care of everything about the underworld. The priest sacrifices spirits and demons in the Pura Dalem, the temple of the underworld, possesses knowledge of exorcist rites and appears in public, especially during burns of corpses and the associated ceremonies for the purification of souls. In everyday life, he determines the best days for important feasts, blesses houses and can also heal the sick. The latter, however, is often the speciality of balian, who is a mixture of mage, medium and physician and specializes in a profession over the course of time. Both men and women can practice this profession and have received their skills as gifts from the gods, but it is often expanded through meditation and the knowledge from secret books. They can communicate with the ancestors, sacrifice to the demons, determine favorable and unfavourable days for certain actions, rituals and healings and find the right place for altars and houses. Most people use their knowledge for good deeds, but some use it also for bad ones.